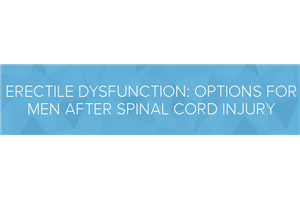 This consumer education sheet, from the Rocky Mountain Regional Spinal Cord Injury System at Craig Hospital, provides information about erectile dysfunction and options for men after spinal cord injury. The document covers several treatment options to help increase the number of erections and how long they last. These options include medications, penile implants, and sexual aids.